January 29, 2010  A wave of bombings this week killed more than 60 in Iraq's capital and left residents jittery, fearing that attacks will increase as the March elections approach. Iraqis are dubious that Baghdad's hundreds of checkpoints and unreliable bomb-detecting devices can protect them. January 29, 2010  Many people in Britain believe former Prime Minister Tony Blair led them into an unjust war in Iraq. That view has been reinforced by this week's evidence at the public inquiry into the justification and conduct of the war. Blair is expected to face six hours of questioning by the panel. January 28, 2010  President Obama gave his first State of the Union address Wednesday night. Ever year, Morning Edition checks some of the facts to find out more about what the president said in his speech. Steve Inskeep talks to: NPR's David Welna on the budget, NPR's Julie Rovner on health care, NPR's Christopher Joyce on nuclear plants, NPR's Jackie Northam on the Afghan war; and NPR's Mary Louise Kelly on the Iraq war. January 27, 2010  Dozens of people died in Baghdad bombings this week. To many Americans, the death toll is another grim statistic in a distant and fading war, but this week's dead include a close friend and Iraqi colleague of the author. January 26, 2010  Dr. Najmaldeen Karim is going back to Iraq to run in the 2010 elections. The Washington D.C.-area neurosurgeon fled his homeland in 1975. Now he's leaving a comfortable life in the U.S. to try for a seat in the Iraqi parliament representing the Kurds of Kirkuk, one of Iraq's ethnic flash points. January 25, 2010  Iraqi TV announced Monday the execution of Chemical Ali, one of Saddam Hussein's top lieutenants. Chemical Ali, whose real name was Ali Hassan al-Majid, was sentenced to death in four separate trials for leading attacks against Iraqi Kurds and Shiites that left tens of thousand dead. January 25, 2010  More than 30 people were killed and dozens wounded in coordinated attacks on three Baghdad hotel compounds popular with Western journalists and businessmen. Iraq's government blamed insurgents linked to former Iraqi leader Saddam Hussein's regime. 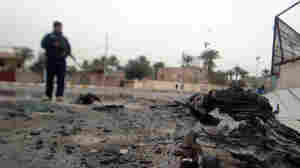 January 25, 2010  Coordinated attacks on three hotels compounds killed dozens of people in Baghdad Monday. The Sheraton, Babylon and Hamra hotels were targeted in the attacks by gunmen and suicide bombers. NPR's bureau is located in the Hamra hotel. January 25, 2010  Dozens of people were killed and more than 70 wounded in coordinated suicide attacks near three hotels frequented by Westerners and foreign journalists. The explosions went off in a 15-minute span and occurred as Iraq announced that Saddam Hussein's notorious cousin "Chemical Ali" had been executed. 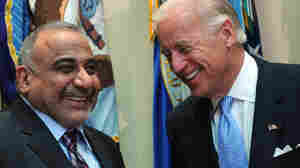 January 24, 2010  Vice President Joe Biden visited Baghdad over the weekend. The White House said the trip had been planned for weeks, but Biden arrived right in the middle of a political crisis. An Iraqi parliamentary committee has disqualified 511 candidates from running in the upcoming general election on the grounds that they're connected to Saddam Hussein's Ba'ath party. American officials fear that the move will alienate Sunni Arabs in Iraq, discredit the election, or even reignite sectarian violence. NPR's Liane Hansen speaks with NPR's Quil Lawrence from Baghdad. January 22, 2010  When an Iraqi committee disqualified more than 500 candidates in the March 7 election for alleged ties to Saddam Hussein's Baath Party, it theatened to reopen a rift between Sunnis and Shiites. Some prominent Sunnis were barred, and concern spread across Sunni Iraq that Shiites in government were trying to cut them out of the race. The vice president aims for a compromise that will allow Iraq to hold a successful election and, in turn, allow the U.S. to begin its planned drawdown of troops. January 15, 2010  A ruling last week disqualified one of the most important Sunni Arab politicians from running in the March elections, on charges that he is connected to Saddam Hussein's Ba'ath party. The move could alienate Sunni Arab voters and threaten. The prime minister has made warnings of a Ba'athist resurgence a central theme of his campaign. January 11, 2010  Iraq's western Anbar province played a role in defeating Iraqi insurgents as local tribal fighters turned on al-Qaida in Iraq. 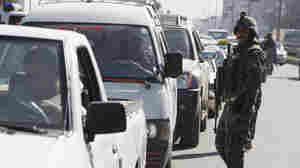 But a slow drumbeat of assassinations and bombings raises questions about stability in the province, as insurgents appear to be exploiting a complicated power struggle.